The SEC filed charges against two hedge fund managers and their source, a former government official, for running an alleged inside information scheme. The Commission charged that the three engaged in deceptive practices to obtain confidential information from the U.S. Food and Drug Administration (FDA). An additional hedge fund manager was also charged with inflating asset values in the portfolios he managed. 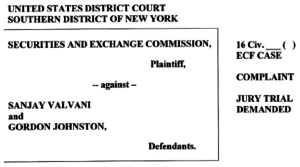 The SEC asserted that Sanjay Valvani accumulated approximately $32 million through the trading of healthcare securities using insider information tips that he received from Gordon Johnston. Johnston, a former FDA employee, acquired his information from former colleagues at the FDA, while also working for a trade association that represented generic drug manufacturers and distributors. The SEC alleged that Johnston used his position and relationships to obtain confidential information regarding FDA approvals, but hid his position as a hedge fund consultant. Johnston provided the undisclosed, confidential information to Valvani. Prior to the information being publicly disclosed, Valvani traded on inside information in the securities of several pharmaceutical companies awaiting FDA approval. The SEC also contended that Valvani passed on the inside information to another hedge fund colleague, Christopher Plaford, who participated in the inside information scheme by making stock trades based on the tips. Plaford was accused of trading on nonpublic information that he obtained regarding an undisclosed forthcoming cut to Medicare reimbursement rates for specific home health services. Separately, the SEC charged Stefan Lumiere with engaging in fraud to falsely inflate the asset value of securities held by a hedge fund that Lumiere and Plaford’s firm managed. The SEC alleged that Lumiere created fictitious broker quotes to manipulate the asset value of as many as 28 securities per month. Lumiere was accused of communicating his desired price values to brokers, who then provided bogus quotes to Lumiere, allowing him to manipulate the values of the securities and obtain roughly $6 million in fraudulent management and performance fees for the investment advisor. The SEC has not made any public statement as to whether this case was itself an actual SEC whistleblower case. The SEC Office of the Whistleblower posts Notices of Covered Action (“NoCA”) for Commission actions where a final judgment or order results in monetary sanctions exceeding $1 million. However, the NoCA list does not disclose if a particular Enforcement action was brought as the result of an SEC whistleblower case, tip, complaint, or referral being filed with the Commission.